Bold colors and designs jump off the page with screenprinted Lokta paper featuring gold brush strokes on bright turquoise paper. Nepalese paper artisans hand-craft Lokta paper out of fibers from the bark of the Lokta bush and then silkscreen eye-catching designs onto the sheet. Nepalese Lokta Paper is a strong, durable and eco-friendly paper handmade from the fiber of the "Nepal Paper Plant," also called the Daphne Shrub or Lokta Bush. The fibers are long and flexible providing exceptional strength, perfect for use in scrapbooking, block printing, origami, design and more. 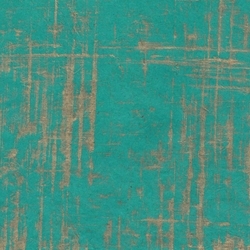 This natural, turquoise-colored Lokta Paper features brush strokes in a shiny metallic gold covering the sheet from side to side. The paper fibers provide texture and angles for dramatic light effects creating a rich, opulent look. Lokta paper provides a wonderful “blank canvas” for art applications, paper crafts and is ink jet and laser printer compatible.